Ask a group of builders how business is these days and many of them will say it’s good. But despite being five years beyond the depths of the Great Recession, with the overall industry posting a 10.5 percent year-over-year increase in the number of new-home sales in 2016, their answers still sound a bit tentative. And who can blame them? Sales and starts remain significantly lower than those posted in 2000–2003, the last years that most analysts consider to be the norm: 961,000 single-family sales and 1.3 million starts vs. 2016’s 560,000 sales and 782,000 starts. Still, a great deal of progress has been made by the industry since its lowest point in 2011. Our 2017 Housing Giants special report, which offers the annual rankings of the country’s largest builders, a state-by-state map of where they are building, as well as a closer look at how mergers and acquisitions affect both buyer and seller and how builders are working their way through increasingly difficult jurisdictional regulations, reveals much about how companies have learned to manage through difficult times. And make no mistake, times are still tough. While household formation is growing and the number of young adults entering their peak housing-demand years is the largest ever, the forces aligned against a homebuying surge for this group are great: Considerable student debt, a trend toward delaying marriage and children, and a lack of affordable homes have combined to cause the share of 18-to-34-year-olds who own a home to fall to a three-decade low. Other challenges come from within the industry itself. Sixty percent of builders surveyed view the ongoing scarcity of skilled labor as the largest obstacle they will face in 2017. Availability of land follows as a close second at 51 percent. Although just a quarter of builders see rising home prices as an issue for 2017, next year’s survey may tell a different tale. While the square footage of the average home remained unchanged in 2016, prices shot up, around 10 percent for starter and first move-up homes and nearly 15 percent for second move-up and beyond, with more increases likely. 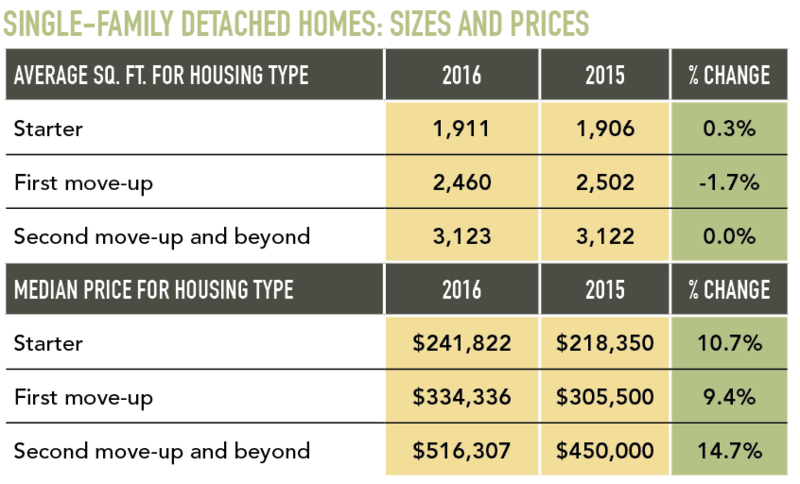 The dearth of labor, land, and buyers able to afford higher-priced homes also has led to a serious lack of inventory in some areas, putting additional pressure on sales. Inevitable rising mortgage rates will increase costs to buyers, as well. And although government regulations fell to No. 6 on the list of challenges this year, it’s clear that many builders continue to feel their pinch. Costly impact and development fees and lengthy permit application and approval processes are onerous in and of themselves, yet community opposition in many areas can deep-six even a project that should go through by right. But challenges beget inventiveness, and home builders are nothing if not resourceful. Instead of going back to the drawing board when a project encounters the modern version of torches and pitchforks, shrewd planners develop alternate scenarios up front in an effort to reach consensus sooner than later and keep their projects moving. Faced with a smaller pool of new-home buyers, a growing number of companies are now offering homes for rent, tapping into the large number of households that want to live in a single-family home but can’t (or don’t want to) buy. Others are moving into the multifamily arena in a bigger way. 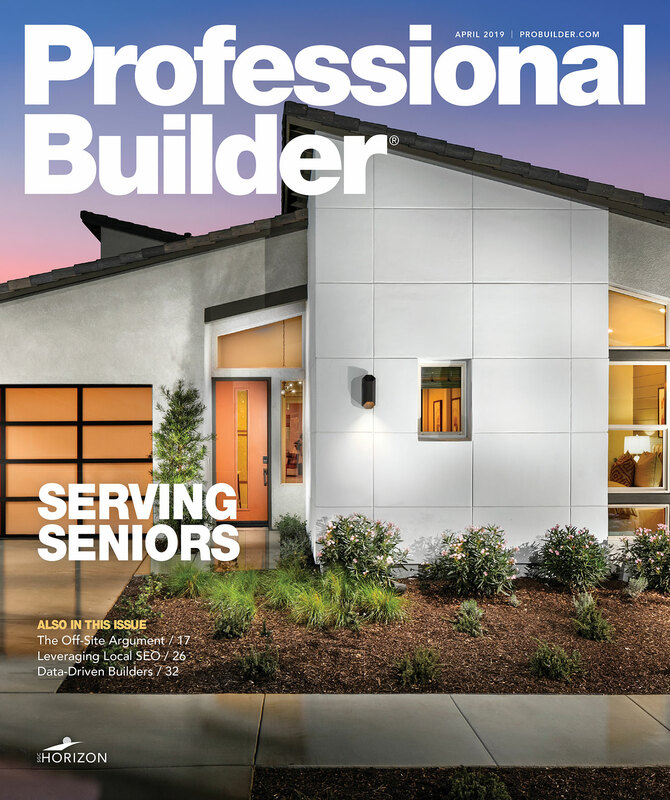 And an increasing number of builders are forging a new path to acquiring capital that can provide opportunities for both organic growth and expansion to new markets: East Coast builder Dan Ryan, for example, sold a 60 percent share of the company to Sumitomo Forestry America in 2016, following in the footsteps of Gehan Homes (2014), and Bloomfield Homes (2013), each of which sold Sumitomo a controlling interest in their companies for an influx of cash. Gehan’s partnership proved to be an exit strategy as well, as it sold its remaining shares to Sumitomo in 2016. Will these growth opportunities come to fruition? Time will tell, of course, but it’s possible that these transactions, along with a spate of new mergers and acquisitions that have already taken place this year, may signal that a more significant recovery is on its way. Certainly, the industry is more than ready to see it happen. Due to the likelihood of increased demand, rising employment rates and wages, and a new pro-business and anti-regulation administration, the March 2017 NAHB/Wells Fargo Housing Market Index builder confidence survey stood at 71, its highest reading in 12 years.